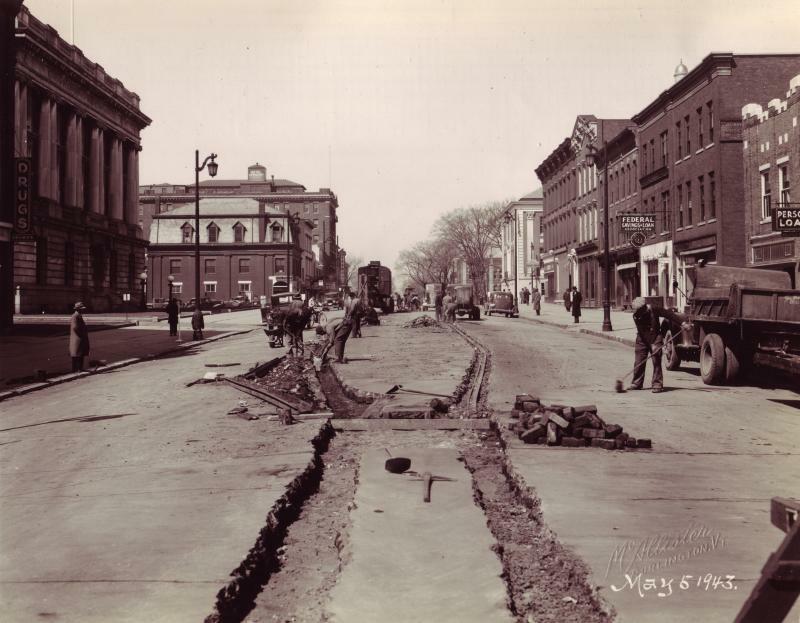 This historic photograph shows workers on Main St., in between S. Winooski Ave. and Church St., removing the rails for the former trolley system. In the left side of the picture, one can see a sign for Brown's Drugs in front of the U.S. Post Office and Customs House. Further down the street one can see a sign for a restaurant reading "SEAFOOD," the Flynn Theatre advertising "My Friend Flicka," and the Vermont Motel behind it. Across the street, behind a few onlookers of the rail removal, one can see the Christian Science Reading Room and the Federal Savings & Loan Association next door. In the foreground there is a pickax and shovel lying in the street. Several vehicles can be seen parked along the street. A few pedestrians on the sidewalk appear to be watching the road work. This is an image of the intersection of Main Street and South Winooski Avenue in 2009. Unlike images of the past, there are no longer cobblestones or trolley rails. In their place is a busy asphalt road with parking on both sides. A traffic light has been added to the intersection, as well as intersections in the distance, and streetlights have a new design. Notice the landscaped trees on both sides of main street, absent in the 1943 photo. There are parking meters on the sides of the road, and manholes in various places in the photo. 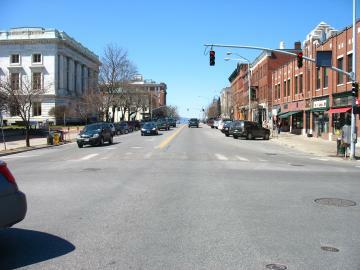 There is a yellow double line separating left and right traffic on Main St.